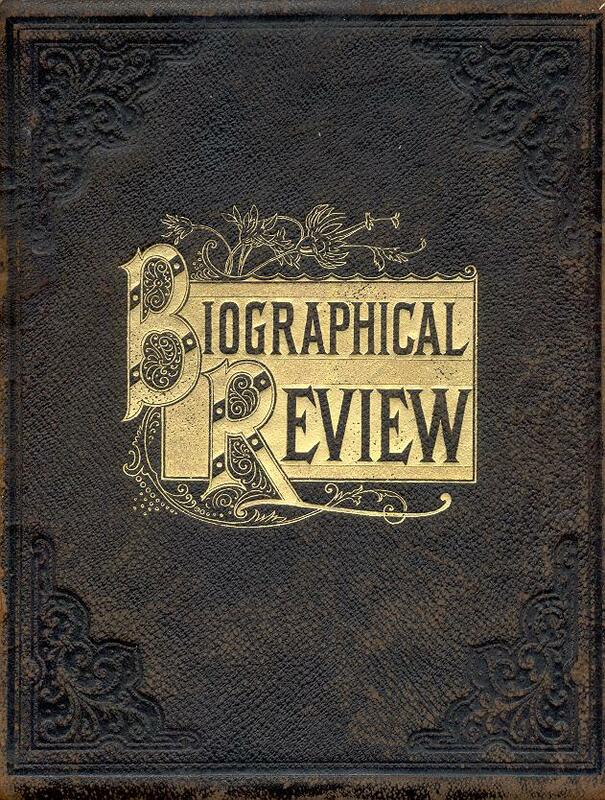 The book, "Biographical Review; This Volume Contains Biographical Sketches of Leading Citizens of Oxford and Franklin Counties, Maine," by the Biographical Review Publishing Company, Boston, Massachusetts, 1897. It is a HUGH book dealing with the ca. 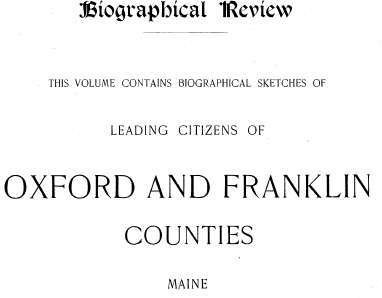 1897 residents of Oxford County and Franklin County, Maine. 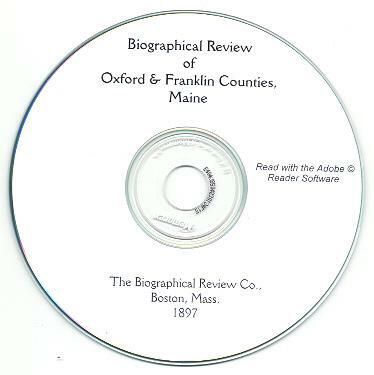 It is filled with genealogical and personal information about various Oxford & Franklin County residents. It has many illustrations of individuals. There are many biographical memoirs or sketches. 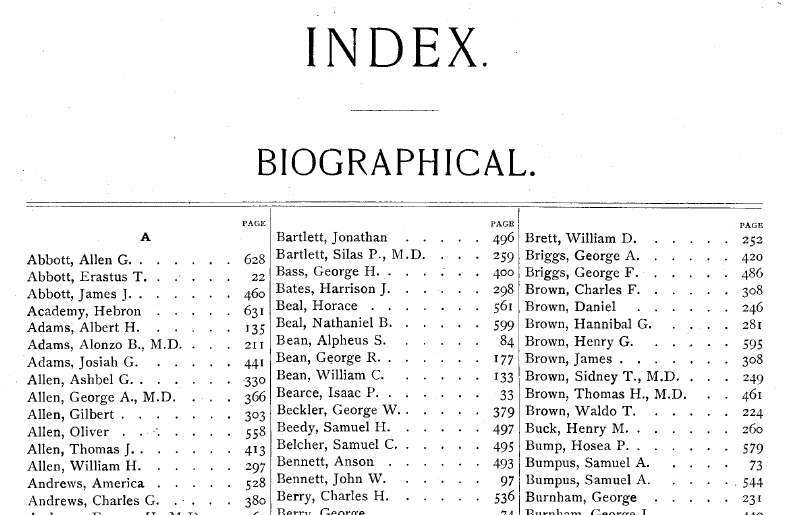 The book has approximately 640 pages, and a full Index. Please note: This is not a paper book, it is a scan of the original paper book into the digital Adobe PDF format, written on a CD-ROM. You read this book on your computer using the free Adobe Reader software. It is a digital version of a hard to find book. If you could find a copy of the 1897 printed book, it would be very expensive. 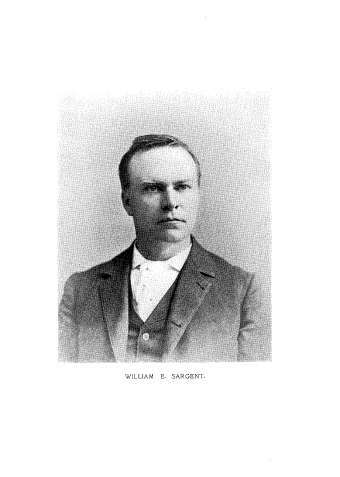 Here is a list of many of the individuals discussed in the biographical sketches. I have not transcribed all of them, only the primary focus of the profile. There are thousands of individuals names and many more surnames then listed here. Allen Abbott, Erastus Abbott, James Abbott, Lizzie Abbott, Albert Adams, Alonzo Adams, Josiah Adams, Julia Adams, Loreda Adams, Persis Adams, Flora Adkins, Angie Allen, Ashbel Allen, Augusta Allen, George Allen, Gilbert Allen, Oliver Allen, Susie Allen, Thomas Allen, Victoria Allen, William Allen, Lavina Ames, America Andrews, Charles Andrews, Eugene Andrews, Freeman Andrews, Lewis Andrews, Loretta Andrews, Lucelia Andrews, Nellie Andrews, Rachel Andrews, Thomas Andrews, John Atherton, Mary Atkinson, Charles Atwood, Eunice Atwood, George Atwood, Dearborn Austin, David Averill, & Fannie Ayer. John Bachelder, Gorham Baker, Nathan Baker, Martha Baldwin, Fannie Ball, Henry Bangs, Mary Bangs, Octavia Bangs, Ella Barker, Frank Barker, William Barker, Calista Barrows, George Barrows, Oscar Barrows, Addie Bartlett, Charles Bartlett, Fred Bartlett, Jonathan Bartlett, Lizzie Bartlett, Nettie Bartlett, Silas Bartlett, George Bass, Anna Bassett, Malinda Bassett, Harrison Bates, Lydia Bates, Horace Beal, Nathaniel Beal, Valora Beal, Alpheus Bean, Edith Bean, Ellen Bean, George Bean, William Bean, Ellen Bearce, Isaac Bearce, George Beckler, Samuel Beedy, Samuel Belcher, Sarah Bemis, Susia Bemis, Anson Bennett, Ella Bennett, Jane Bennett, John Bennett, Ruth Bensley, Charles Berry, Fanny Berry, George Berry, Isaac Berry, William Berry, William Bickford, Emily Bigelow, George Billings, Leander Billings, Benjamin Bird, Elisha Bisbee, Stanley Bisbee, A. Judson Blake, Almira Blake, George Blake, Isaac Blake, Jane Blake, Martha Blake, Walter Blake, John Blanchard, Sarah Boardman, N. Dayton Bolster, Albion Bonney, Charles Bonney, Cynthia Bonney, Harrison Bonney, Nancy Bowles, William Boyington, Leona Brackett, Sarah Brackett, Albion Bradbury, Bial Bradbury, Martha Bradeen, Samuel Bradford, William Bradley, Evelyn Brainerd, Ellen Brett, William Brett, Dora Brickett, George Briggs, Charles Brown, Daniel Brown, Elmira Brown, Emma Brown, Hannibal Brown, Harriet Brown, Henry Brown, James Brown, Lucy Brown, Martha Brown, Rose Brown, Sidney Brown, Thomas Brown, Waldo Brown, Priscella Brownell, Elvina Bryant, Emily Bryant, Mary Anna Bryant, Sabrina Bryant, Clementia Buck, Henry Buck, Melissa Buck, Emily Buckman, Hosea Bump, Samuel Bumpus, Sarah de Albra Bumpus, Flora Burbank, Priscella Burbank, George Burnham, Francis Butler, Ellen Butterfield, J. Warren Butterfield, & James Butterfield. William Calden, Joseph Caldwell, William Caldwell, John Calhoun, Elvia Calwell, Mary Canwell, George Carroll, Mary Carter, Timothy Carter, Albert Caswell, Alden Cates, Frances Chadbourne, Everett Chandler, George Chandler, Harold Chandler, Harriet Chandler, Horatio Chandler, Ebenezer Chapman, Malvina Chapman, Timothy Chapman, William Chapman, Phebe Charles, Ruth Charles, Stephen Charles, Adaline Chase, James Chase, Frank Chick, Louisa Chick, Naomi Childs, Sophia Church, Kingman Churchill, Daniel Clark, Sarah Clark, Laura Clifford, Cynthia Cobb, George Coburn, William Coburn, Solon Coffin, Elizabeth Colburn, Rebecca Colburn, Alvira Cole, Clara Cole, Etta Cole, Ransom Cole, Richard Cole, Lelia Coleman, Daniel Collins, Joshua Collins, E. F. Conant, Hiram Conant, Joseph Conant, Cordelia Cook, Eli Cook, Charles Coolidge, Dana Coolidge, John Coolidge, William Cooper, Aaron Corbett, Hendon Cousins, Henry Coy, Mary Craig, Samuel Craig, Emily Cram, Abijah Crane, Abbie Crockett, Cynthia Crockett, George Crockett, Sarah Crockett, Alice Crooker, Thomas Croswell, Lydia Crowell, Charles Cummings, David Cummings, Hiram Cummings, John Cummings, Mary Currier, James Curtis, Simeon Curtis, William Curtis, Esther Cushing, Caleb Cushman, Elizabeth Cushman, Mary Cushman, Samuel Cushman, Ellen Cutler, & Luella Cutts. Albert Daggett, Reliance Daggett, Washington Daggett, Abigail Dakin, James Danforth, Henry Dascomb, Emma Davis, Herrick Davis, Henry Day, James Day, Mellen De Shon, Adelbert Dean, Lottie Decker, John DeCosta, Almon DeCoster, E. F. Decoster, James DeCoster, Erastus Deering, James Deering, Jessie Deering, Adelbert Delano, Kate Denison, Harlan Dennison, Elbridge Dill, Frances Dillingham, Flora Dinsmore, Rosetta Doble, Emma Dodge, Charles Dorr, Lucy Dorsett, Deborah Doten, Timothy Doten, Sarah Doughty, Joseph Dow, Martha Dresser, Ansel Dudley, E. Gertrude Dudley, Ella Dudley, Eugene Dudley, James Dudley, Charles Dummer, Emily Dunham, Samuel Dunham, Sarah Dunham, Ellen Dunn, John Dunsmoore, Fannie Durgin, William Durgin, Asa Dutton, Charles Dyer, Frank Dyer, Zaccheus Dyer, & Everett Dyke. Rebecca Eades, George Eastman, Tobias Eastman, Cyrus Eaton, Mary Eaton, Lorenzo Edgcomb, Ina Edgecomb, Julia Edgecomb, A. D. Ellingwood, Hiram Elliott, Vesta Emerson, Israel Emmons, Jennie English, Abbie Eustis, Charlotte Evans, Ella Evans, Sumner Evans, Bertha Everett, Hiram Everett, Mattie Everett, & Persian Everett. 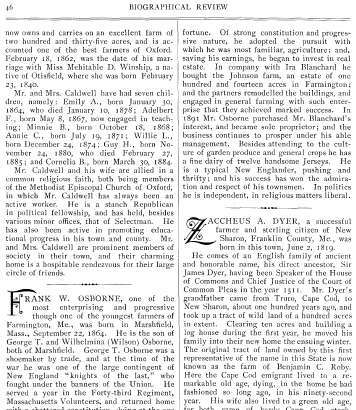 Fairfield Farrar, Harrison Farrar, Walter Farrar, Wilbur Farrar, Hannah Farrington, Olover Farrington, Seymour Farrington, James Farris, William Faunce, Emily Fellows, Alonzo Felt, Lucy Felt, Chesley Fernald, George Fernald, Betsy Fickett, Ernest Field, Mary Fields, H. F. Fitch, Lena Flanders, Mary Fletcher, Charles Flint, Harland Flint, Henry Fobes, Dana Fogg, Arthur Forbes, Lizzie Forbes, Lucelia Forbes, Mary Forbes, Orra Foss, Clarence Foster, Sarah Foster, John Fox, Melissa Fox, Rhoda Frazier, George Frederic, Ralph Freeman, Augustus French, Ellen French, Albiah Frost, Dollie Frost, Frederick Frye, Charles Fuller, Henry Fuller, Julius Fuller, Martha Fuller, Maurice Fuller, John Furber, Harry Furbish, & John Furnel. Mercy Gale, William Gammon, Chandler Garland, Hiram Gatchell, Willis Gatchell, Albion Gee, Arthur George, Charles George, John Gerry, Eliza Gibson, Clara Giles, Mary Gillman, Henry	Gilman, Mary Gilman, Caleb Gilmore, Wesley Ginn, Mary Given, Enna Gleason, Abbie Glines, Frank Glover, James Glover, Horatio Godwin, Julia Goff, Sewell Goff, Georgia Goodrich, Albion Googins, Albion Gordon, Mary Gordon, Samuel Gordon, Elias Gould, Charles Green, Daniel Green, Marianne Green, Mary Green, William Green, Albert Greenwood, Zina Greenwood, Susan Griffin, Albert Griffith, Clara Grinnell, George Grose, Amos Grover, Emma Grover, Mehitable Grover, Melissa Grover, Laura Guild, Lemuel Gurney, & Ruth Gurney. Abbie Hackett, Evelina Hackett, Hepzibah Haines, Esther Hall, Myra Hall, Robert Hall, Sadie Hall, Solomon Hall, Sarah Ham, Charles Hamilton, David Hamilton, Mary Hamilton, Ruth Hamilton, Calvin Hamlin, Marietta Hamlin, Walter Hamlin, Eliza Hammond, Henry Hammond, Jarius Hammond, Andrew Hapgood, Nathaniel Harding, Alvin Hardy, Jeffrey Hardy, Lucy Hardy, Anna Harlow, Hattie Harmon, Granville Harnden, Harmon Harnden, Augusta Harriman, Julia Harriman, Cynthia Harris, Martha Harris, Bezer Harvey, Edwin Haskell, Ella Haskell, Lydia Haskell, Peter Haskell, David Hastings, Edwin Hatch, Ivah Hatch, Sarah Hatch, Charles Hathaway, Lydia Hathaway, Cyrus Hayes, Francina Hayes, Maria Hayes, Nancy Hayes, Otis Hayford, Joshua Heald, Llewellyn Heald, Ella Heath, Mariah Heath, Walter Heath, Emma Henderson, Frances Herrick, Artemas Hersey, Ezra Hersey, Henry Hersey, Louella Hersey, George Higgins, Lelia Higgins, Susan Higgins, Amanda Hill, Charles Hill, Frank Hill, Laura Hill, Mary Hill, Dorris Hillman, Sophronia Hillman, Joseph Hines, Lona Hines, James Hiscock, Edward Hitchcock, Esther Hoar, Sarah Hoar, George Hobbs, Hiram Hobbs, Mary Hobbs, Charles Hodgkins, Francis Holden, Cornelius Holland, Albert Holman, Annie Holmes, Florence Holmes, Charles Holt, Daniel Holt, Fred Holt, Eliza Hooper, Herman Horne, John Horne, Ann Horr, Marietta Horr, Lula Hosmer, Herman Houghton, Joseph Houghton, Martha Houghton, Albert	Howard, Joshua Howard, Fannie Howe, Freeland Howe, Huldah Howe, Mary E. Howe, George Howes, Nellie Howes, Clinton Hubbard, Mary Hubbard, Lydia Humphrey, John Hunter, Mary Hussey, Flora Hutchinson, & Stephen Hutchinson. Eleanor Irish, Eliza Irish, Emily Irish, Mary Irish, & Orlando Irish. Ann Jackson, Judith Jackson, Lemuel Jackson, Lucretia Jackson, Lizzie Jenkins, Albro Jenness, G. F. Jennings, John Jennings, Mary Jewell, Isaac Jewett, Joann Jewett, Amanda Johnson, Cordelia Johnson, George Johnson, Ira Johnson, Margaret Johnson, Sarah Johnson, Albion Jones, Mabel Jones, Caroline Jordan, Elsie Jordan, Sarah Jordan, Alvin Judkins, & Irene Judkins. William Keen, Georgia Keene, Heloise Keith, Hezekiah Keith, Joseph Keith, Leonard Keith, Benjamin Keyes, Martha Keyes, Flora Kidder, Mary Kilbourne, Benjamin Kilgore, Harriet Kilgore, Susan Kilgore, Flora Kilkenney, George Kimball, Hanry Kimball, Sallie Kimball, Sarah Kimball, Sarah King, Silas King, William Kneeland, Nathaniel Knight, William Knightly, Albert Knowles, Belle Knowlton, Newell Knowlton, Samuel Knowlton, & Sylvanus Knox. William La Baron, Charles Ladd, Louisa Lakin, James Lambert, Kate Lamson, Mary Lancaster, Wintworth Lander, William LeBaron, Frances Lewis, Eva Libby, Julia Libby, Levi Lincoln, Andrew Linscott, Samuel Locke, Jonathan Longley, Frank Lord, Jennie Lord, Martha Lord, Mary Lord, Matilda Lord, Elmer Lovejoy, Esther Lovejoy, Amanda Lowell, Emma Lowell, Maria Lowell, Frank Luce, Rebecca Luce, J. Madison Ludden, Edwin Lufkin, Vesta Lufkin, & Hannah Lunt. Elzoda Macomber, George Macomber, Sarah Maddocks, Benjamin Makepeace, Grace Mallon, Lewis Mann, Ida Manning, William Manning, Nancy Manter, William Manter, Mary Manwell, Jarvis Marble, Ada Marsh, Albion Marsh, Harriett Marsh, Cordelia Marshall, Ella Marshall, Ezra Marshall, Lizzie Marshall, Mary Hannah Marshall, Martha Marston, Mary Marston, Susan Marston, Jonathan Martin, Lyman Martin, Ernest Marwick, Ansel Mason, Appleton Mason, Hezekiah Mason, John Mason, Lucinda Mason, Eliza Mayhew, Hilton McAllister, Joshua McAllister, Levi McAllister, Nancy McAllister, Tena McAllister, William McDonald, Bertrand McIntire, Justine McIntire, Leslie McIntire, Alvin McKeen, David McKeen, Ella McKeen, Linnie McKeen, Charles McKenzie, Edgar McLain, Angeline McWain, Augusta Mead, Elizabeth Meader, Otis Melindy, Charles Mellen, George Mellen, Milton Merriam, Ezekiel Merrill, Hannah Merrill, Jennie Merrill, Melissa Merrill, Sarah Merrill, Charles Miller, Gilbert Miller, Hattie Miller, Esther Millett, John Millett, Maria Millett, Martha Millett, Nathan Millett, Sarah Millett, Daniel Mills, George Mills, Nathan Mills, Abbie Mitchell, Eliza Mitchell, Milo Mitchell, Eliza Moore, Keturah Moore, Arthur Morrison, James Morrison, William Morrison, Albert Morrow, Ann Morse, Dolly Morse, Elias Morse, Hannah Morse, Marian Morse, Martha Morse, Myrtie Morse, Ada May Morton, Eliza Morton, Henry Morton, John Morton, William Morton, & Sarah Mosman. Evelyn Nason, Austin Nelson, Eugene Nelson, Edith Nevers, Sarah Newell, Matilda Newton, Eldora Nichols, Mary Nichols, Walter Nichols, Ada Nickerson, Silas Niles, Elvira Noble, Francis Noble, Rachel Noble, Edwin Norcross, Everett Norton, La Forest Norton, Philinda Norton, Zachariah Norton, Abraham Norwood, Augusta Noyes, Frank Noyes, Mary Nutter, & Laura Nuttnall. Alfred Oakes, Hiram Oldham, Hannah Orr, Frank Osborne, Eliza Osgood, Gertie Owen, & Horace Oxnard. Asa Packard, Charlotte Packard, Francis Packard, Frank Packard, Zibeon Packard, Julia Palmer, Hanry Park, Henry Parker, Mary Parker, Phoebe Parker, Thomas Parker, Edith Parlin, Mary Parlin, Arthur Parsons, Emery Parsons, Lydia Parsons, Martha Parsons, Stephen Parsons, Isabella Partridge, Fanny Patten, Mary Paul, Howard Pease, Julia Pease, Edward Penley, Silas Perham, Alvin Perkins, Charles Perkins, Ella Perkins, George Perkins, Harrison Perkins, Samuel Perkins, Joseph Perry, Osgood Perry, Eliza Peterson, Waldo Pettengill, Ellen Phelps, Flora Philbrick, Hattie Phillips, Nellie Phillips, Ann Coolage Phinney, William Pierce, Bion Pike, Carrie Pike, Frank Pike, John Pike, Almon Pingree, Mary Pingree, Arthur Pinkham, Joel Plummer, Lillie Plummer, Linnie Plummer, Margaret Plummer, Samuel Plummer, Charles Porter, Eunice Porter, Franklin Porter, Fred Porter, Harriet Porter, Ida Porter, James Porter, Lizzie Porter, Rachel Porter, Sylvanus Porter, Elba Potter, Mary Potter, Oraville Potter, Emily Pottle, Lizzie Pottle, Horace Prescott, David Presson, David Pride, Charles Prince, Job Prince, Kimball Prince, Carroll Proctor, Elvira Proctor, & Gerrie Proctor. Elbridge Rackliffe, John Rackliffe, Hiram Ramsdell, Anna Rawson, Arabella Rawson, Nellie Record, Alice Reed, Ellen Reed, Hannah Reed, Jane Reed, Lewis Reed, Austin Reynolds, Lydia Reynolds, Mary Reynolds, George Rice, Henry Rice, Sarah E. Rice, Lucinda Rich, Affie Richards, Charles Richards, George Richards, John Richards, Abbie Richardson, Betsey Richardson, Stephen Richardson, Thomas Richardson, Edward Richmond, Henry Richmond, Rosella Richmond, Harriet Rideout, George Ridlon, Julia Rigg, Albert Robbins, Rhoda Jane Robbins, John Roberts, Avis Robinson, Edward Robinson, Fannie Robinson, George Robinson, John Robinson, Louisa Robinson, Abram Ross, Eastman Ross, Mary Ross, Isaac Rounds, Charles Rowe, Leander Rowe, Lucinda Rowe, Samuel Rowe, Anna Russell, Brendena Russell, Jesse Russell, Laura Russell, Charles Ryerson, & Mary Ryerson. Abel Sanborn, Fred Sanborn, Marshall Sanderson, William Sargent, Joshua Saunders, Alice Sawin, Henry Sawin, Lewis Sawin, Nancy Sawin, Charles Sawyer, Edwin Sawyer, Hattie Sawyer, Martha Sawyer, Cora Schwart, Huldah Sears, Alden Severy, Calvin Sewall, William Sewall, Calvin Shaw, James Shaw, Lavina Shaw, Emma Shea, Alva Shurtleff, Frank Shurtleff, Jesse Simmons, Cora Skillings, Francis Skillings, John Small, Lydia Small, Marcus Smart, Annette Smith, Ephraim Smith, Mary S. Smith, Ruth Smith, Sarah Soule, Thankful Spaulding, Hilda Sprague, Thomas Spring, Jordan Stacy, Horace Stanley, Elizabeth Stanwood, Lottie Stanwood, Ellen Staples, Frances Staples, Gideon Staples, John Staples, Lizzie Staples, Roscoe Staples, Charles Starbird, Clinton Starbird, Eckley Stearns, Henry Stearns, Horatio Stearns, James Stearns, Martha Stearns, Sarah Stearns, Sylvanus Stearns, Josiah Stetson, Rollin Stetson, Ella Stevens, John Stevens, Mary Stevens, William Stickney, Jane Stilson, Sarah Stoddard, Allie Stone, Elbridge Stone, Frank Stone, Harriet Stone, Mary Stone, Rufus Stone, Asa Stowers, Harriett Stowers, Mabel Stowers, Mary Streeter, Phillip Stubbs, Hannah Sturgis, Bertha Sturtevant, Julia Sturtevant, Olynthia Swallow, Daniel Swan, Ida Swan, Lucetta Swan, Mary Swan, Thomas Swan, Cordelia Sweet, Lavinia Sweet, Harriet Swett, Abbie Swift, & Fidelia Swift. Jabez Tarbox, Sarah Tarbox, Wallace Tarbox, Harriet Taylor, Orianna Taylor, Rufus Taylor, William Taylor, Ellen Teague, E. I. Tebbits, Marion Tenney, Abbie Thayer, Dora Thayer, Harriet Thayer, George Thomas, Hannah Thomas, Mary Thomas, Robert Thomas, William Thomas, Albert Thompson, Amelia Thompson, James Thompson, Augustus Thurlow, Jacob Thurston, Lydia Tibbets, Fremont Timberlake, Isaac Titcomb, Hezekiah Tolman, Nancy Tolman, Charles Toothaker, Frank Toothaker, John Toothaker, Clarinda Towle, William Towle, Mary Towne, Rollin Towne, Edith Townsend, Lucy Townsend, Ann Trask, William Trask, Joseph Trefethen, Julia True, Roscoe True, William True, Albion Tubbs, Charles Tubbs, George Tubbs, Benjamin Tucker, Cora Tucker, Cyrus Tucker, Elias Tucker, James Tucker, Peter Tufts, Edward Turner, Orrin Turner, John Twaddle, Samuel Twitchell, Frank Tyler, & Martha Tyler. Margaret Upton, & Maria Upton. Jabez Vaughan, Nancy Verrill, Emma Viles, Emma Vining, Fremont Vining, George Virgin, Aphia Voter, Louis Voter, & Warren Voter. Peleg Wadsworth, Byron Waite, Willis Waite, Albert Walker, Carlton Walker, Charles Walker, Ephraim Walker, Fred Walker, George Walker, Mary Walker, Zerua Walker, Allie Walton, John Ward, Emma Wardwell, Gilbert Wardwell, Ann Warren, Emily Warren, Frank Warren, Nancy Warren, Olivia Warren, Ira Warriner, Samuel Waterman, Cordelia Watson, Frank Watson, Susannah Watson, William Watson, Josephine Wayman, Frances Webster, Henry Webster, Susan Webster, Achsa Weeks, Merritt Welch, Julia Wendell, Esther Wentworth, Julia Wentworth, Lizzie West, John Weston, Elbridge Wheeler, Frances Wheeler, Olive Wheeler, Charles Whibley, George Whibley, Roxanna Whitamore, William Whitcomb, Lydia White, Velora White, Verdeil White, Thomas Whitehead, Sarah Whitehouse, George Whitman, John Whitman, William Whitmarsh, Columbia Whitney, Eben Whitney, Flora Whittemore, Joshua Whittemore, Lillian Whittier, Phineas Whittier, Eliza Wight, Ephraim Wight, Willard Wight, Joel Wilbur, Emma Wilcox, Frank Wilder, Ann Wiley, Harriet Wiley, Mary Wiley, Ella Wilkins, Ada Willard, Eliza Willard, Frances Willard, Irene Willard, Charles Williams, Charles Wilson, Nancy Wing, Jere Winslow, Lelia Winslow, Albert Witham, Jane Witham, Rosina Witham, Edward Witt, John Wood, Eliza Woodbury, Enoch Woodbury, Hannah Woodbury, Horatio Woodbury, Esther Woodworth, James Wright, Mary Wright, & John Wyman. Octavius Yates, Elias Yeaton, Mary York, Rachel York, William York, Almira Young, & Charles Young.